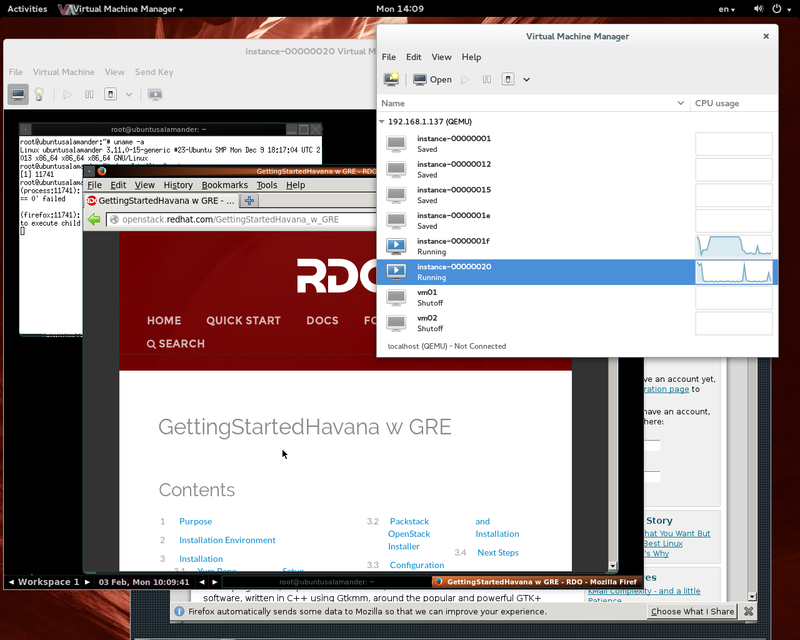 In particular, Two Node (Controller+Compute) RDO Havana cluster on Fedora 20 hosts been built by myself per guidelines from http://kashyapc.wordpress.com/2013/11/23/neutron-configs-for-a-two-node-openstack-havana-setup-on-fedora-20/ was Neutron GRE cluster. 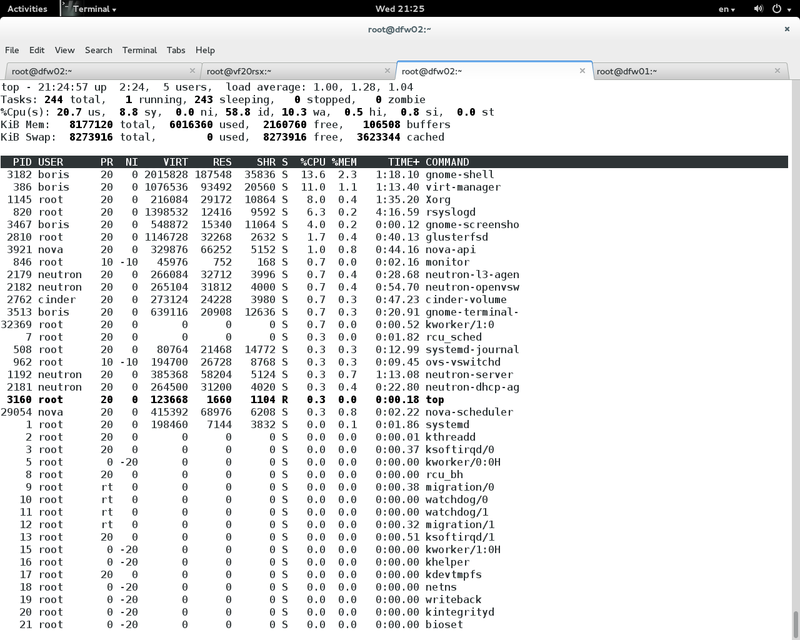 Hence, for any instance has been setup (Fedora or Ubuntu) problem with network communication raises up immediately. apt-get update just refuse to work on Ubuntu Salamander Server instance (default MTU value for Ethernet interface is 1500). 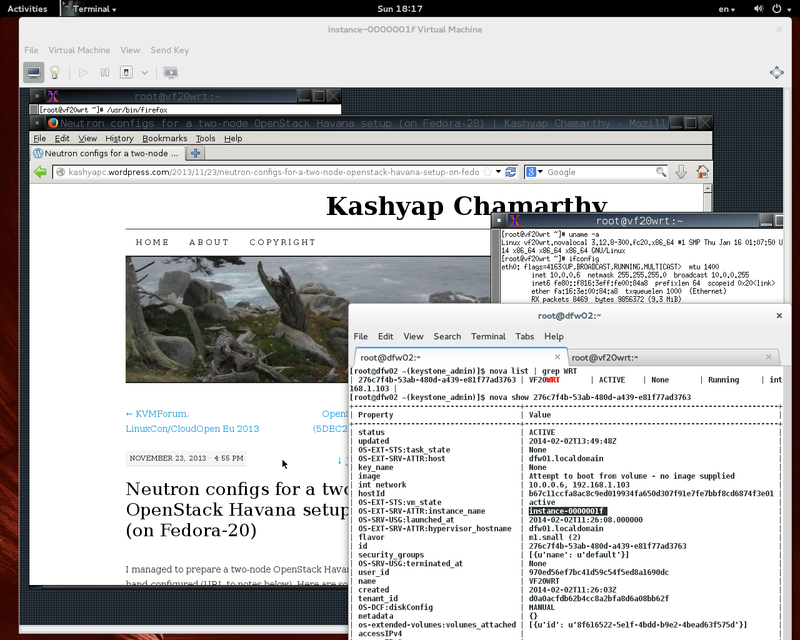 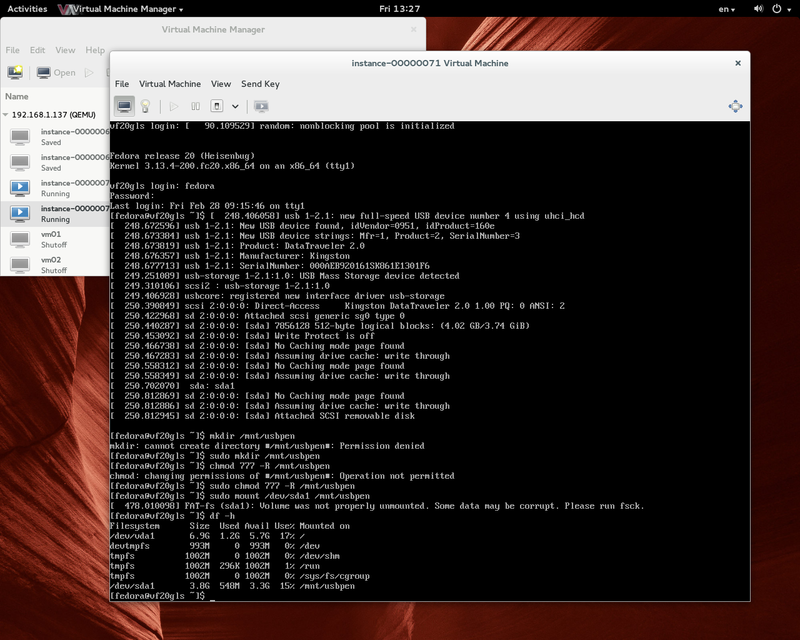 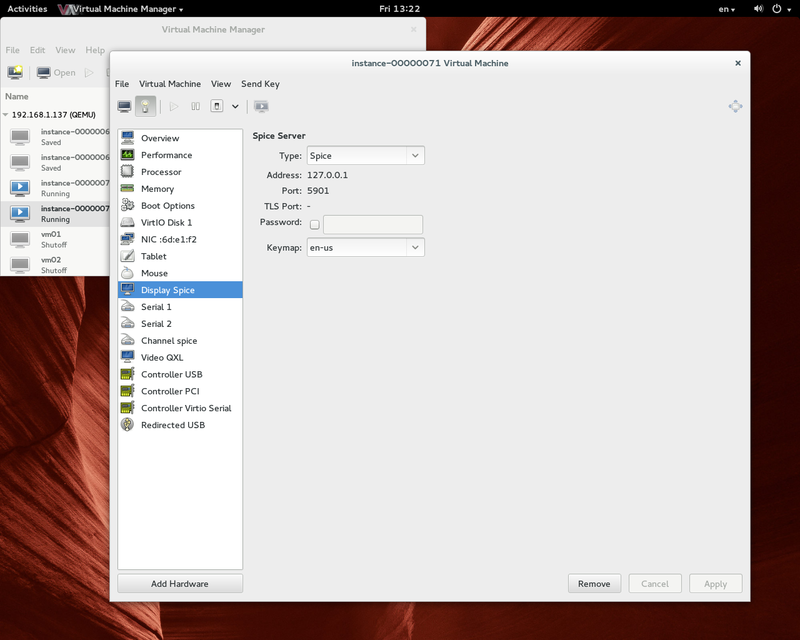 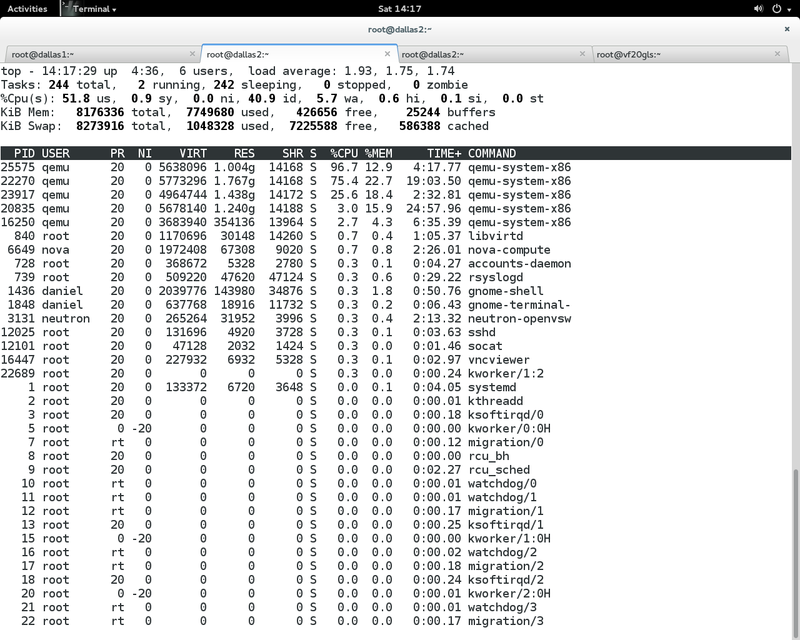 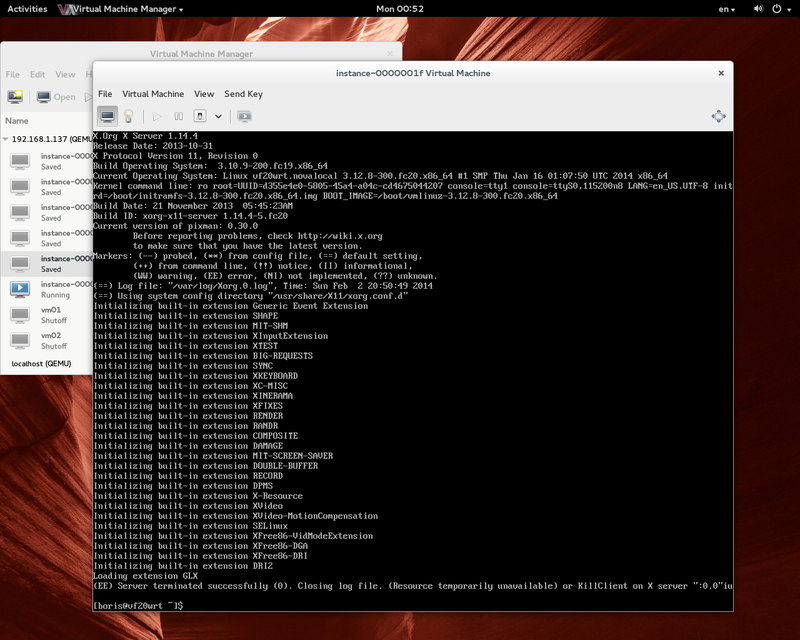 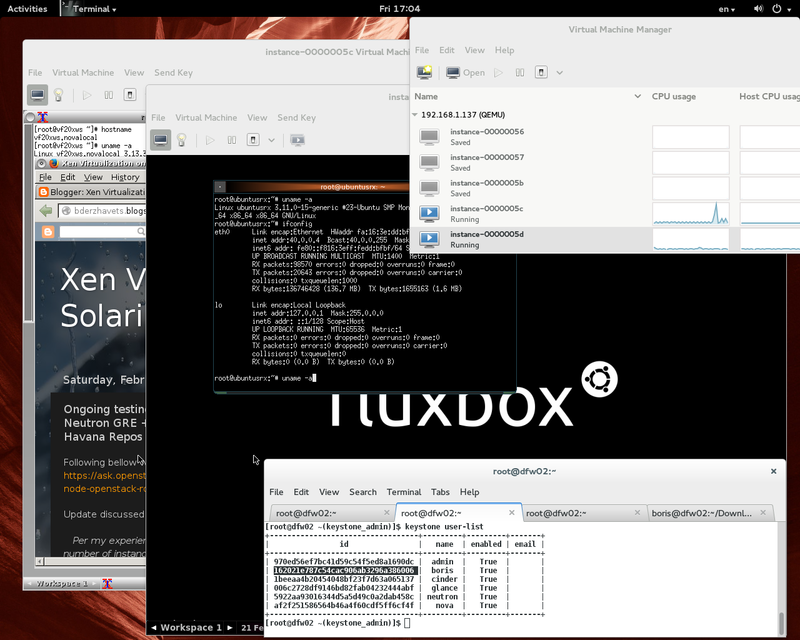 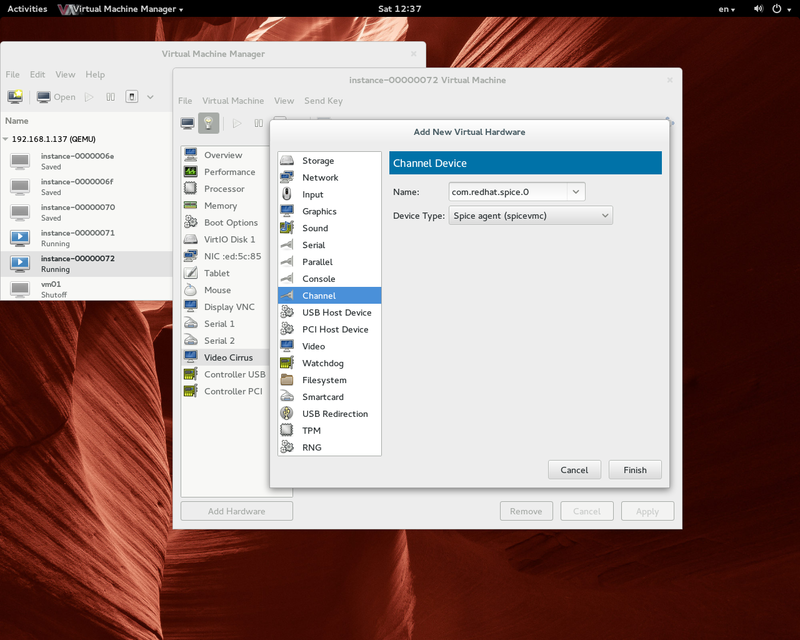 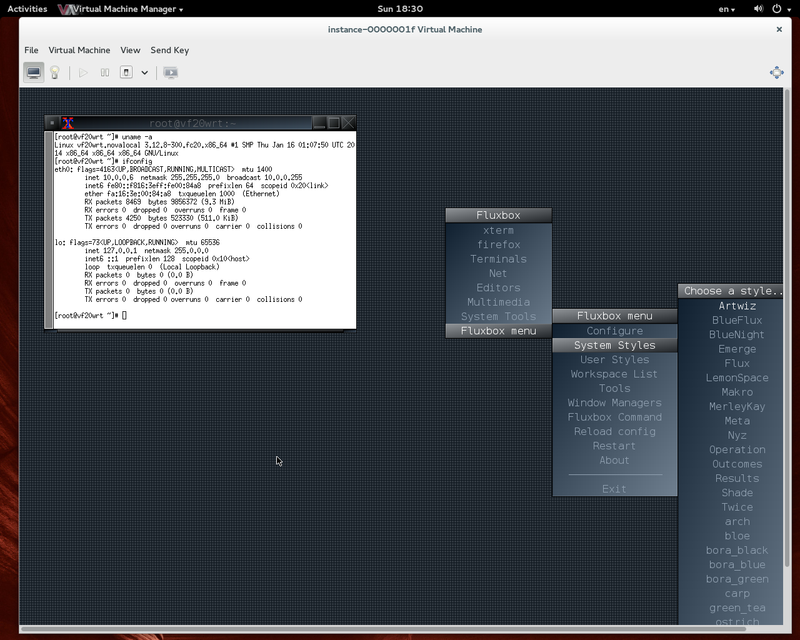 Light weight X windows environment also has been setup on Fedora 20 cloud instance (fluxbox) for quick Internet access. 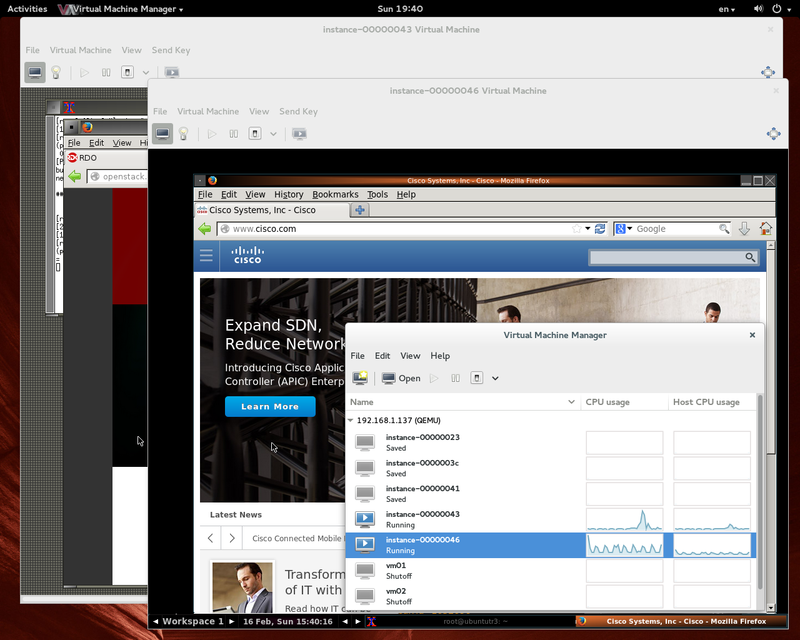 Solution is simple to set MTU to 1400 only on any cloud instance. 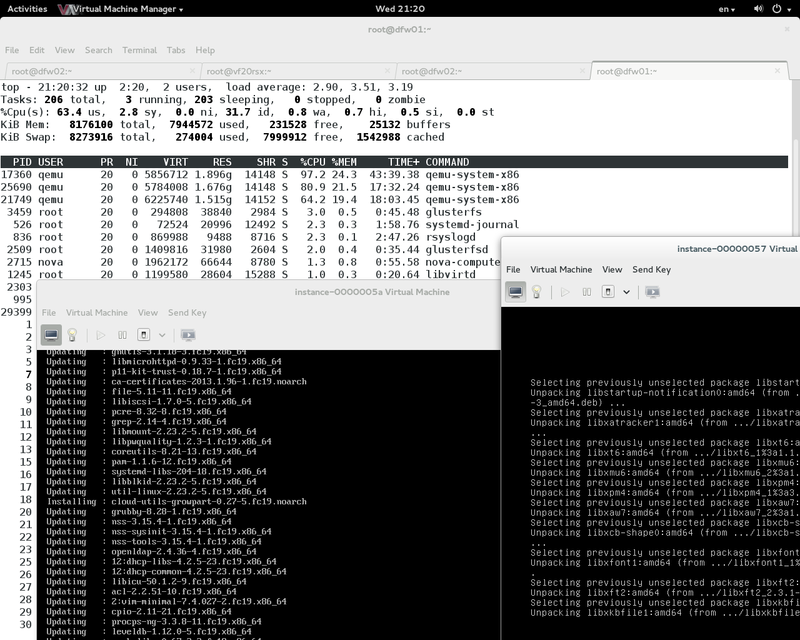 At least in meantime I don’t see problems with LAN and routing to Internet (via simple DLINK router) on cloud instances F19,F20,Ubuntu 13.10 Server and LAN’s hosts. 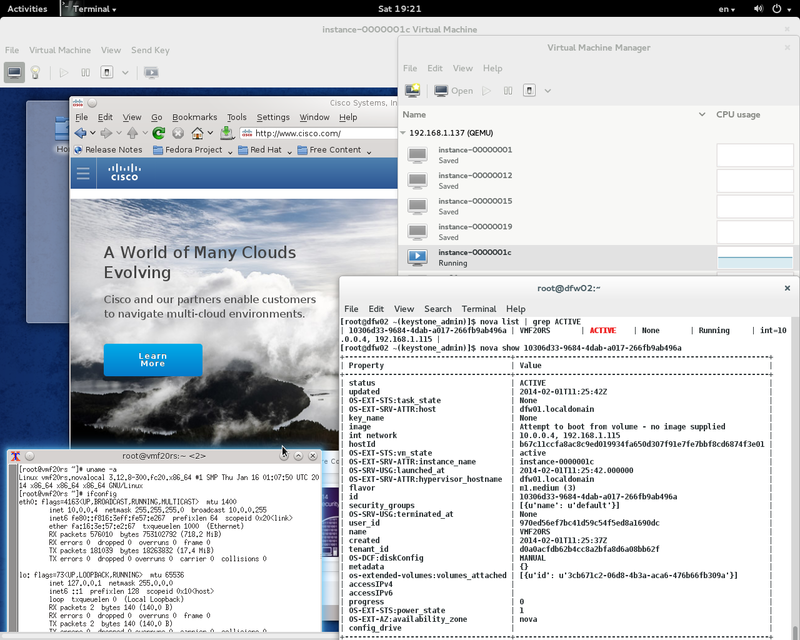 For better understanding what is all about please view http://bderzhavets.blogspot.com/2014/01/setting-up-two-physical-node-openstack.html . 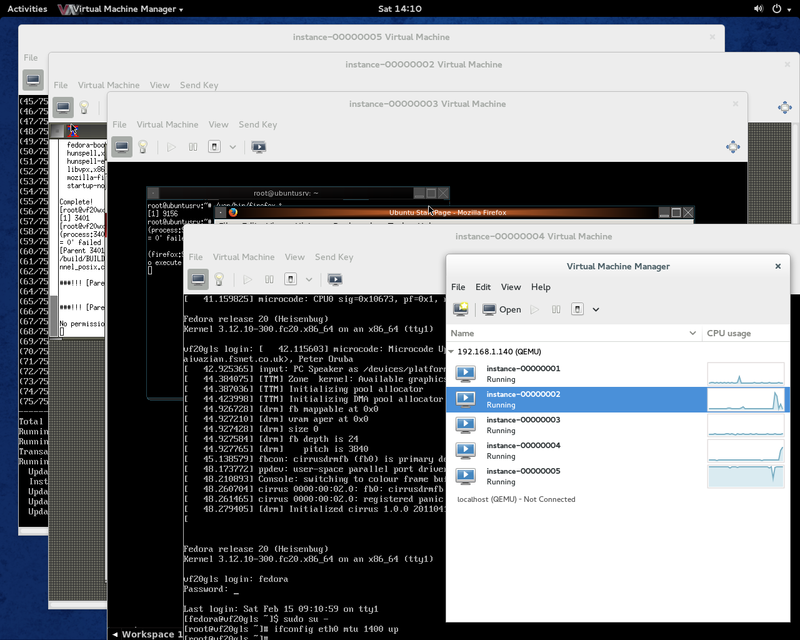 Setup Light Weight X Windows environment on F20 Cloud instance and running Fedora 20 cloud instance in Spice session via virt-manager ( Controller connects to Compute node via virt-manager ). 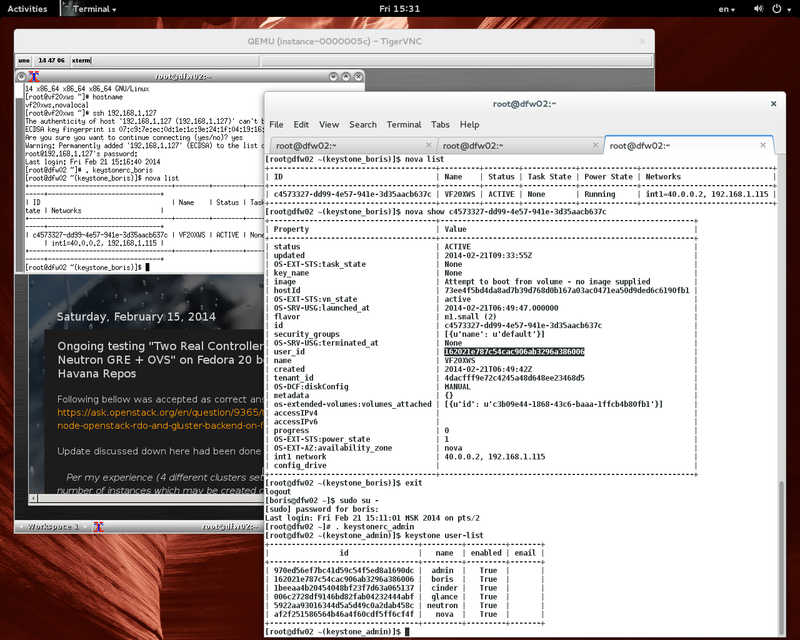 Spice console and QXL specified in virt-manager , then `nova reboot VF20WRT`. 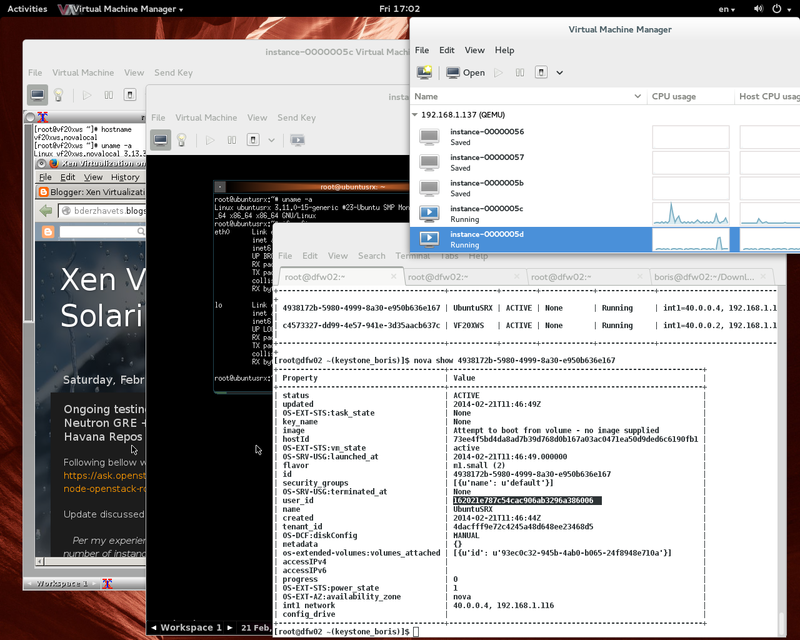 Following bellow builds Light Weight X Windows environment on Fedora 20 Cloud instance and demonstrate running same instance in Spice session via virt-manager ( Controller connects to Compute node via virt-manager ). 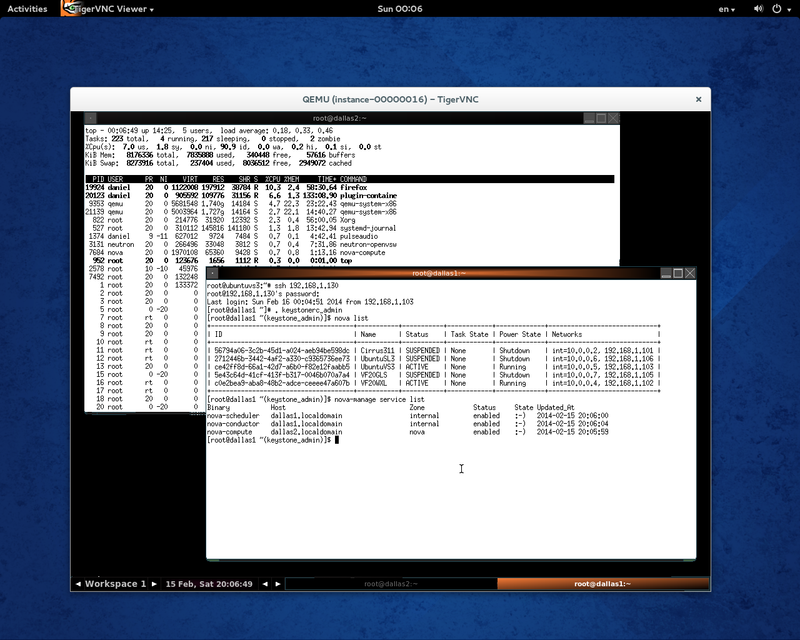 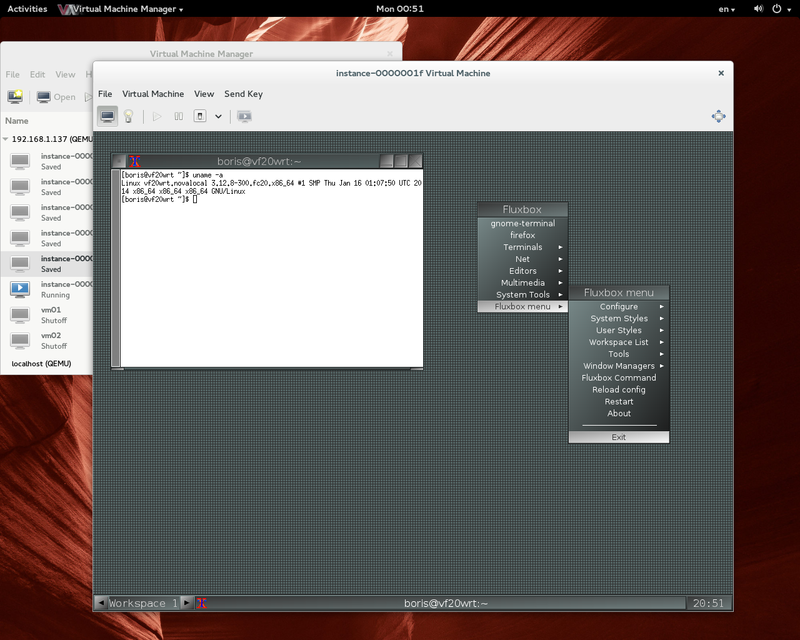 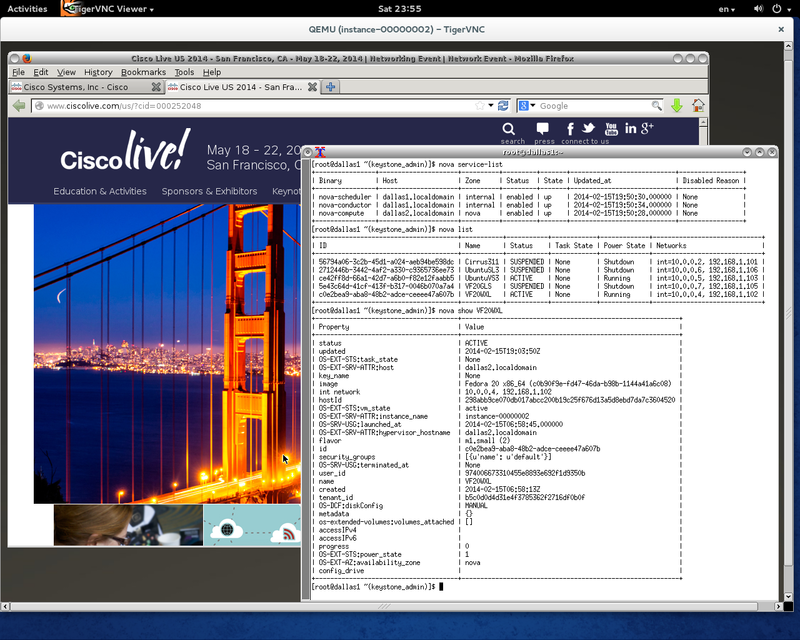 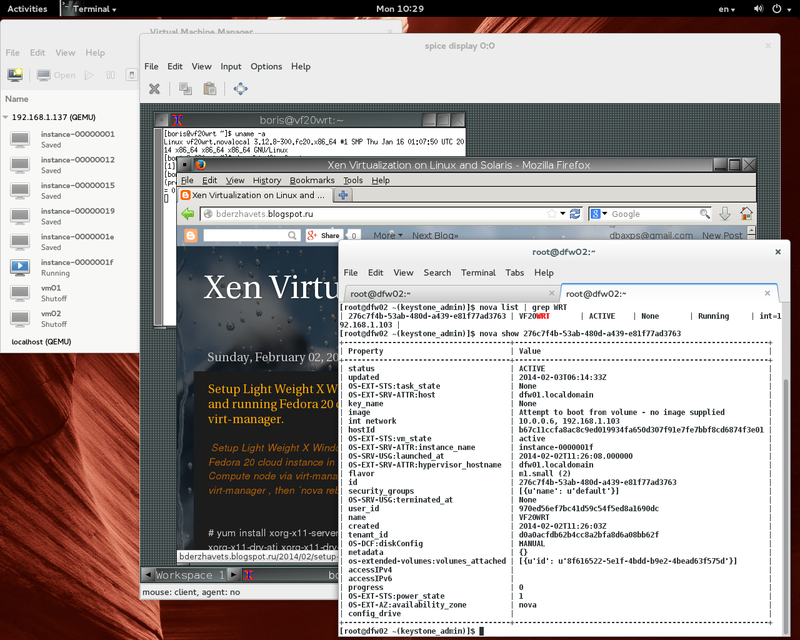 Spice console and QXL specified in virt-manager , then instance rebooted via Nova. 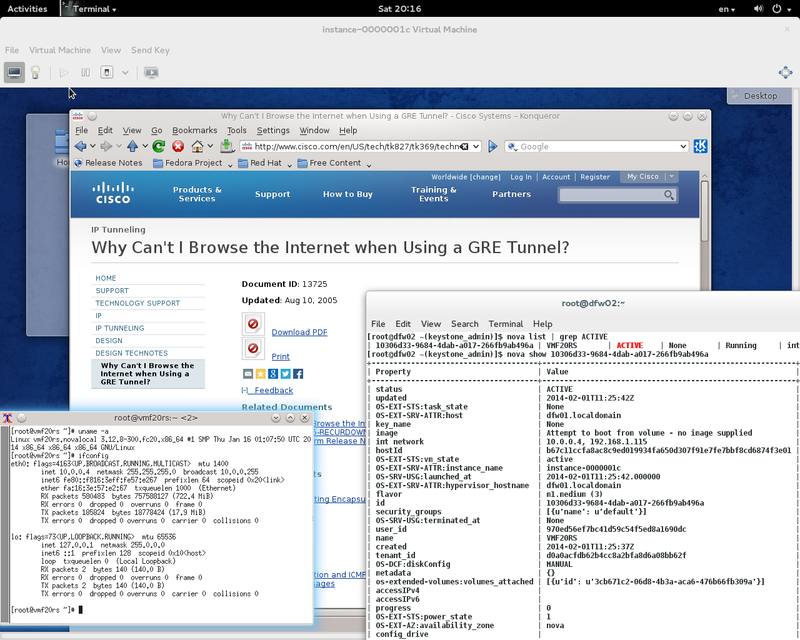 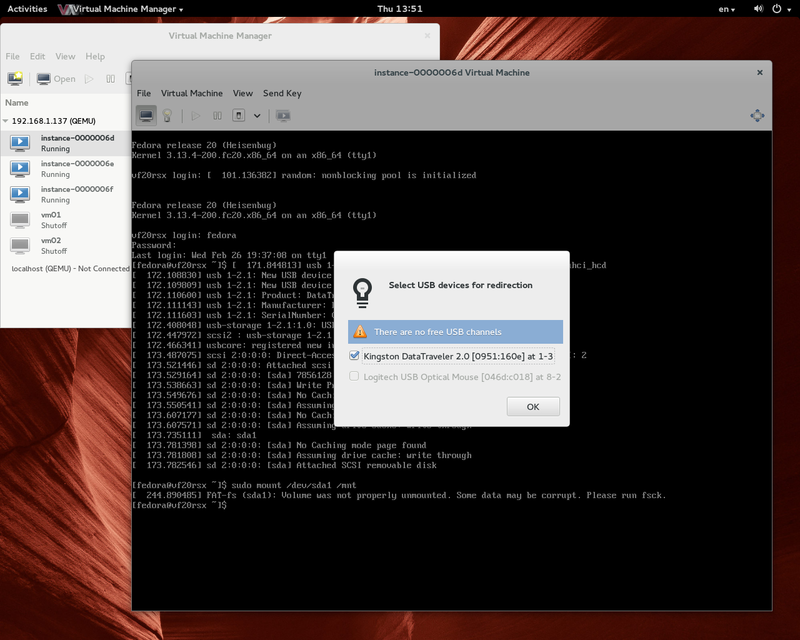 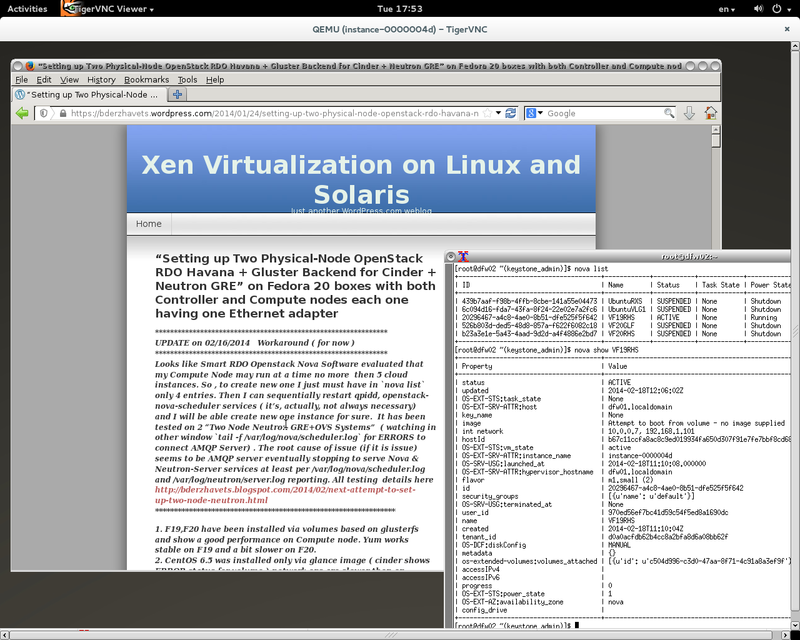 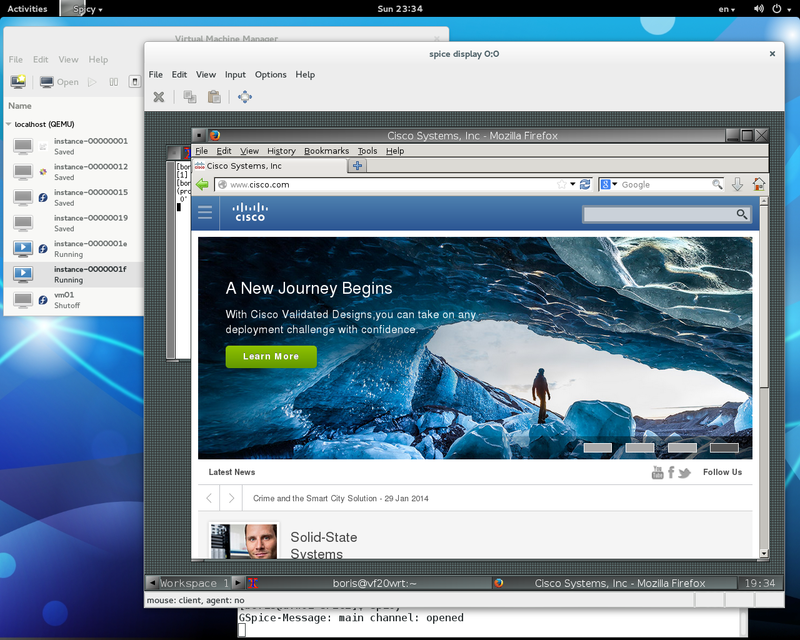 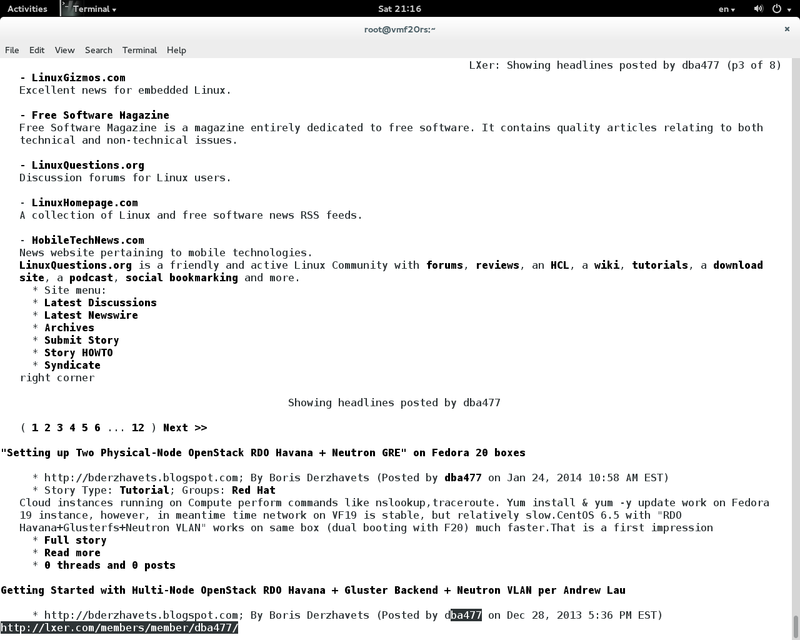 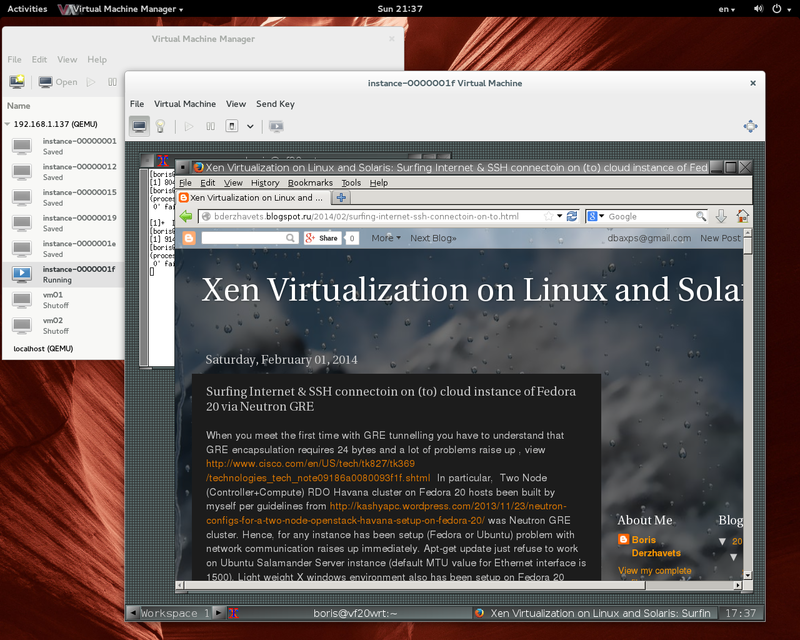 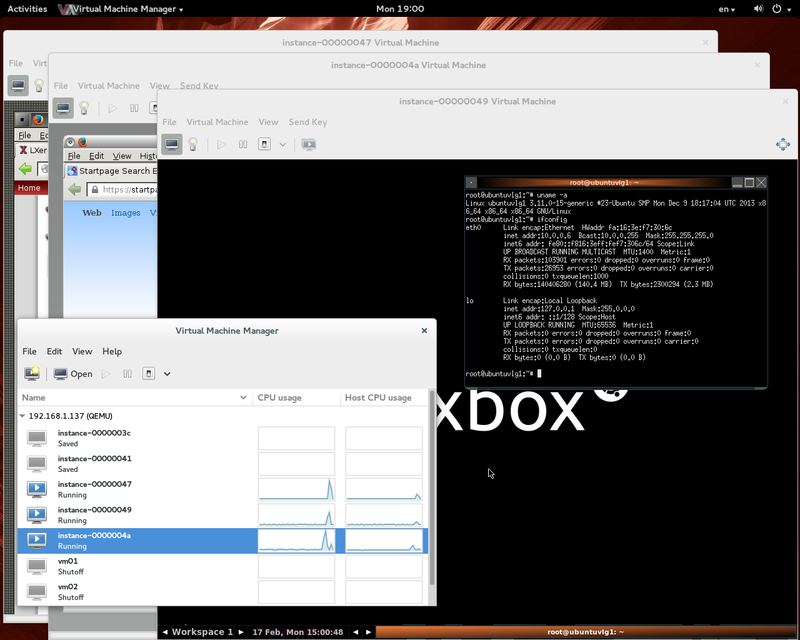 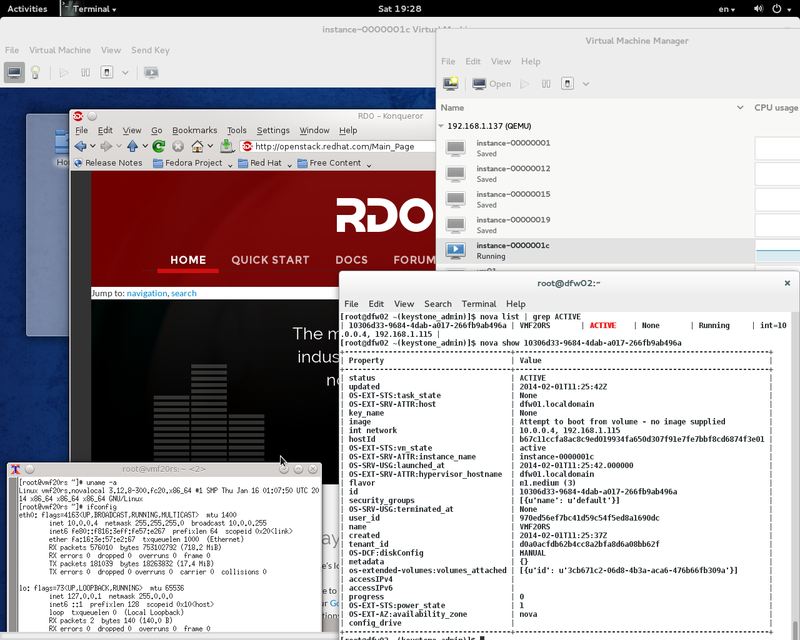 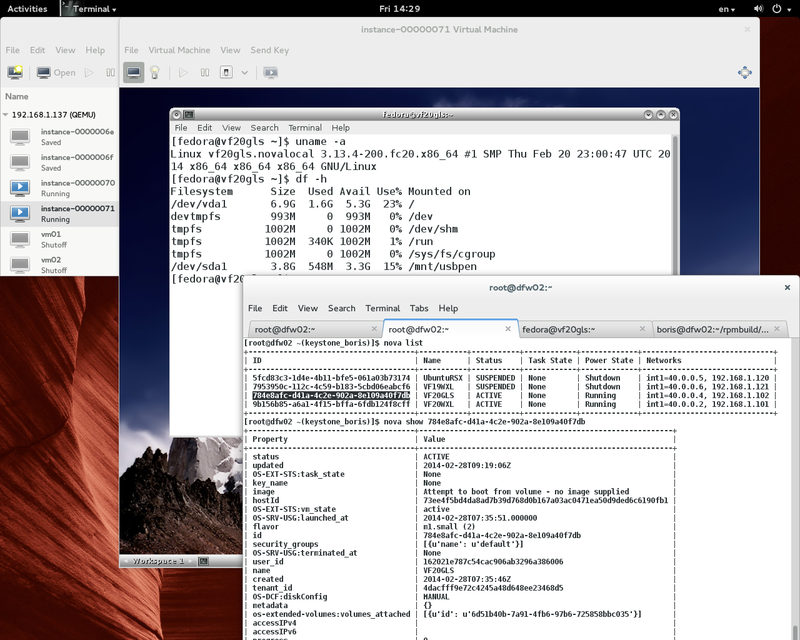 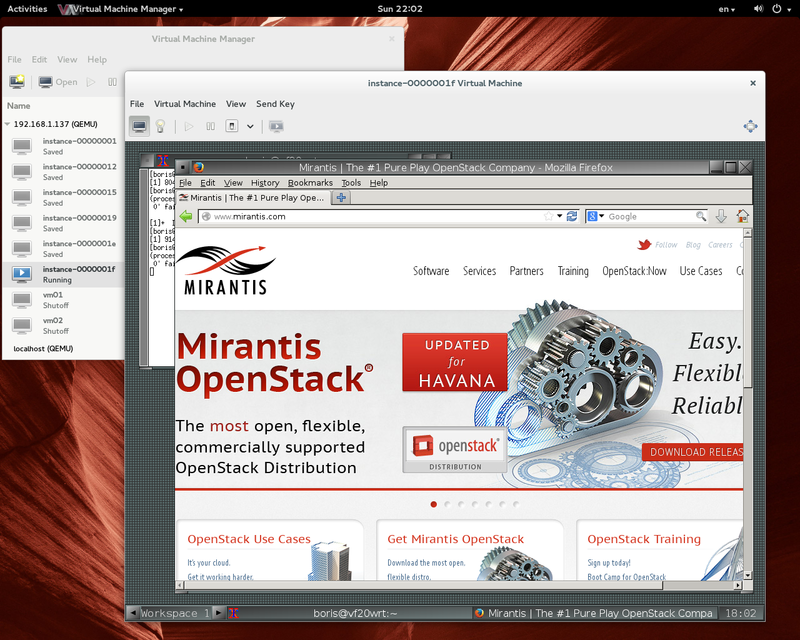 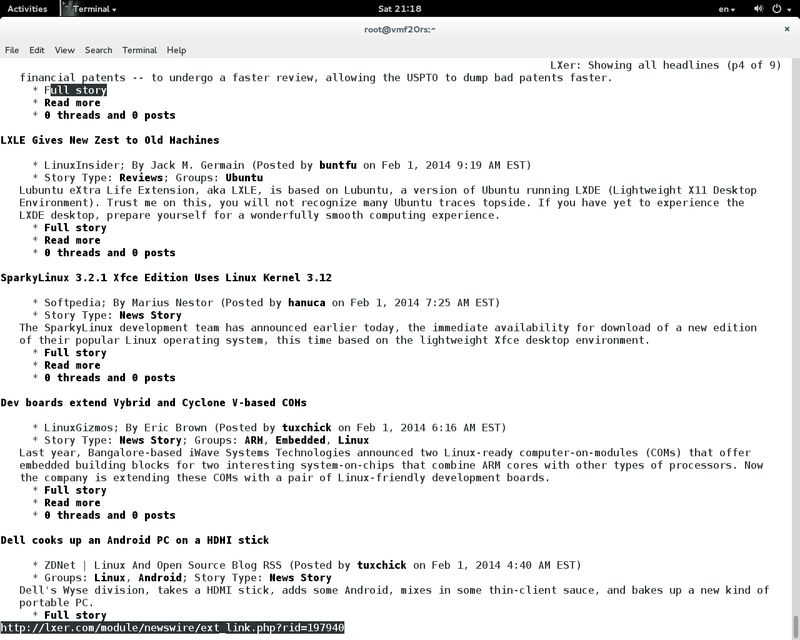 You are currently browsing the Xen Virtualization on Linux and Solaris blog archives for February, 2014.